The annual Met Gala 2017 hosted by Metropolitan Museum of Art was held on Monday in New York City. Despite Hollywood’s biggest and famous celebrities spilled their magic at the red carpet, the newbie Priyanka Chopra made her debut fantabulously and nobody could ignore her presence. Priyanka Chopra’s debut at the Met Gala 2017 in Ralph Lauren’s trench coat dress took the internet by storm. 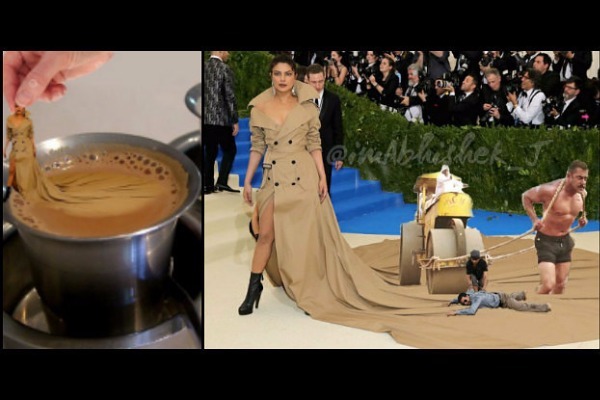 Priyanka Chopra wore world’s longest trench coat which caught attention of fashion critics and fan followers on socail media and left them in babble. While our desi people showed up their best creativity in most hilarious way on twitter and called her dress with many different names – tent, taadpatri, pocha, SwachhIndia 🙄 etc etc ? ? ?